At nearly 500 pages, Louisa Morgan’s A Secret History of Witches (2017) might seem daunting, but it’s partitioned into five sections, individually focusing on a subsequent member of the Orchiére family as they flee persecution in France, set up roots in England, and eventually become involved in World War II. I zipped through this book in an afternoon, and while romance does have its own part to play, the interactions between mothers and their daughters is the most significant aspect of the novel. Throughout centuries, Orchiére women have cultivated magical gifts, ranging from basic charms or talismans to complex spell-crafting and scrying, assisted by their animal familiars. Naturally, such behavior is poorly received by surrounding townsfolk and their own husbands from time to time, with reactions tending toward the murderous. But whether used to facilitate animal husbandry or social ambitions, their magic gives them power and agency, two attributes which have historically been in short supply for women. The Orchiéres also claim Romani ancestry, though this has little to do with plot or characters, seeming to serve mostly as shorthand for prior persecution and ostracization. After a brief prologue detailing the reason for the Orchiéres’ flight from a witch-hunter in Brittany, A Secret History of Witches begins with Nanette, the youngest member of the family. Her aunts, who raised her after her mother died in childbirth, carry on the family’s magical traditions of celebrating solstices and performing certain rituals, and eventually train Nanette. Later, Nanette trains her daughter, Ursule, who grows up thinking of herself solely as Cornish and scorns witchcraft as silly nonsense until her power unexpectedly manifests itself. Ursule’s desire to have a daughter and carry on the family line causes trouble, both for herself and Nanette, though her actions do result in the birth of Irène, whom Ursule raises in Wales. Irène, determined to be more than a rough and calloused farmwife, uses magic to raise her social standing and achieves tremendous wealth at great cost. Her daughter, Morwen, is a kind girl with an affinity for horses, and when her father organizes an advantageous-but-repellant marriage without her consent, she makes her own future in the bustling metropolis of early 20th-century London. Finally there is Veronica, a thoroughly English young woman who knows nothing of her heritage or potential gifts until WWII strikes and a mysterious royal decree arrives at her doorstep. Each of the five books within A Secret History of Witches covers a relatively brief but momentous period in its character’s life, usually when the woman in question is in her late teens to early twenties, relying on the next section to reveal that character as an older woman and her interactions with members of the next generations. As in real life, some of the mother-daughter relationships are sweet, some are fraught with conflict, and some are nonexistent due to varying circumstances. Every main character is distinct and has her own motivations, sometimes resulting in bittersweet results, though the women generally face the effects of their choices with good grace. Readers are certain to find at least one favorite character, and equally as likely to disagree strongly with at least one of the Orchiére women. Morgan’s prose pushes the overall narrative at a rapid pace that still allows for small moments of introspection, and she incorporates enough appropriate details about technological advances and fashion to distinguish one time period from another. 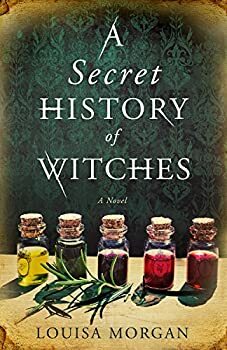 A Secret History of Witches is an enjoyable novel, treating readers to glimpses into the history of a loving and complicated family, as well as the changing world around them. Published September 5, 2017. A sweeping historical saga that traces five generations of fiercely powerful mothers and daughters – witches whose magical inheritance is both a dangerous threat and an extraordinary gift. Brittany, 1821. After Grand-mere Ursule gives her life to save her family, their magic seems to die with her. Even so, the Orchires fight to keep the old ways alive, practicing half-remembered spells and arcane rites in hopes of a revival. And when their youngest daughter comes of age, magic flows anew. The lineage continues, though new generations struggle not only to master their power, but also to keep it hidden. But when World War II looms on the horizon, magic is needed more urgently than ever – not for simple potions or visions, but to change the entire course of history. I was eyeing this in B&N last weekend. Thanks for the review–I need to check this out! I think you’d really enjoy it, Kelly!